Believe it or not, there are breweries outside of Other Half and Grimm making awesome beers in New York City. Sitting a few blocks away from the Barclay’s Center in the heart of Brooklyn is Threes Brewing. The setting is a triple threat: it serves as a bar, rotating restaurant, and most importantly a brewery. Led by co-founders Joshua Stylman, Justin Israelson and head brewer Greg Doroski, Threes has quietly made a name for themselves within the local beer community. Recently, Threes released a new batch of Superf*ckingyawn, a beer I became familiar with about a year ago. I was at a bar in NYC when I saw them add Superf*ckingyawn to the tap list, and of course when you see a name like that, it’s only right to give it a shot. I remember being stoked that someone in my hometown had finally cracked the code of a high ABV hoppy beer that didn’t taste like straight booze. As I sat down recently with a fresh batch, I only hoped that I had not set my expectations too high. The beer pours a golden color, almost entirely translucent, with little to no haze. All you neckbeards out there calm down; remember back to that time long ago (probably just two years) when we actually sought out beers that weren’t a hazy juice color? The name Superf*ckingyawn is actually intended to poke a fun at the current fixation the craft beer community has about Northeast hoppy beers. When you see clear hoppy beers today, you automatically assume it’s a West Coast style and probably either a malt or pine bomb. The nose, however, is what threw me off; apparently, you can’t always judge a beer by its color. The aroma is extremely floral, with hints of mangos, citrus and other tropical fruits (welcome back, beards). While 9.5% ABV is big, this beer is anything but boozy; it’s almost dangerous how little booze you actually taste. I’m hit with a ton of juice on the front end, followed by a tame pine bite on the back end. If the pour and aroma weren’t telling enough, the mouthfeel is what confirms it; Superf*ckingyawn could be a bigger version of Lawson’s Sip of Sunshine. The same color, same nose, and almost the same mouthfeel. Threes has just increased the ABV by 1.5% without sacrificing any citrus. 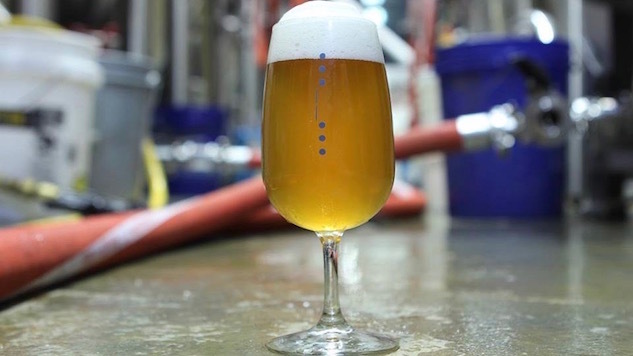 You might be reading this and thinking, “Great, you piqued my interest, but I’m nowhere near NYC.” Don’t worry; while Threes is currently only on tap at the moment, they are planning to begin canning their beers this April, with Superf*ckingyawn being the fifth or sixth can release.